I note that you stated that your trip to the UK will cost you £1100, this is approximately 4 times your monthly income. I do not find it credible that you spend this amount on a trip. I am a single woman, with no financial responsibilities and I saved up for this trip because I really wanted to visit the UK. 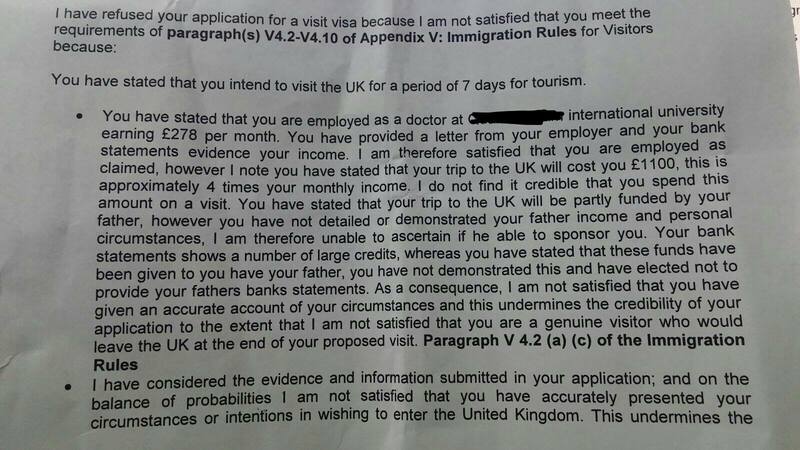 How do I prove to the ECO and the authorities that spending £1,100 for my trip wouldn't have caused me any financial harm neither would I have had to access UK government funds? Another concern of mine is that if I reapply without the partial funding of my father or get sponsored by a different person, does the amount given by my father previously cause hindrance in my visa application? Won't they still reject it on the basis of my pay being too insignificant? The OP should complain about the poor quality of the refusal notice. That's a high priority. Based upon some additional background info the OP provided, it became evident that the REAL reason for her refusal was she failed to establish a credible premise for her visit. She also didn't establish why a single woman of marriageable age wants to visit the UK. Doing that is important in South Asia. I understand this point may be contentious with some, but personal circumstances make up an important part of the decision. The refusal notice focuses entirely on technical points none of which map in to her personal circumstances. Possibly a paragraph or two got accidentally deleted by the assistant? She needs to get a proper refusal notice and that should be part of her complaint. For the OP's premise to work, she needs to explain the disproportionate expense she is taking on. Personal enrichment? Peer status? Romance? Literacy? Shopping? What does she expect to gain by spending so much for a 7 day trip? The OP needs to explain the irregular cash flows in her bank statements. The OP needs to explain why her father is sponsoring her. The OP needs to read all of the questions/answers in this link. The OP will apply again in about a month, and while preparing her application will come here with highly focused and very clear questions. The complete chat transcript is here. See for the amount that you have mentioned as monthly income the visa officer is bound to think that you might visit UK to find a job and assuming that you are not married and don't have enough savings or any property in your name, creates further doubt that you might not return. Don't apply for at least 6 months.